I didn’t have a chance to enjoy a sit down meal at Real Food Daily, although I did go into into two locations, and was so happy that I did. In West Hollywood, I grabbed a chocolate chip cookie to go on my walk to the original Farmers’ Market (not really a true market as I know it now) and the The Grove knowing that there would not necessarily be an organic, vegan place for a treat. In Santa Monica, I stopped by to pick up a take out order for lunch back at our hotel, so we could eat outside. It’s hard to justify eating indoors when we were days away from coming back to winter in Toronto and it was sunny outside! I really enjoyed my spicy tempeh club sandwich with a side of delicious caesar salad, a light but rich vinaigrette with capers and blue corn croutons with a lemon kombucha. I also treated myself to a Maple Bacon “faux nut” at the last minute – their vegan and organic take on a cronut. I have a hard time passing up that combo. I loved the combination of salty, smoky and sweet. The icing reminded me of the Tori‘s icing we got with our gingerbread house. I wish I had the opportunity to sit down and sample more of the specials off their menu like the Sea Cake, the Not-chos, their Lasagna or their Lentil Mushroom burger, but the day that my brother, sister and dad went, my mother and I ate at MAKE (not suitable to serve someone with nut allergies), which was worth it! 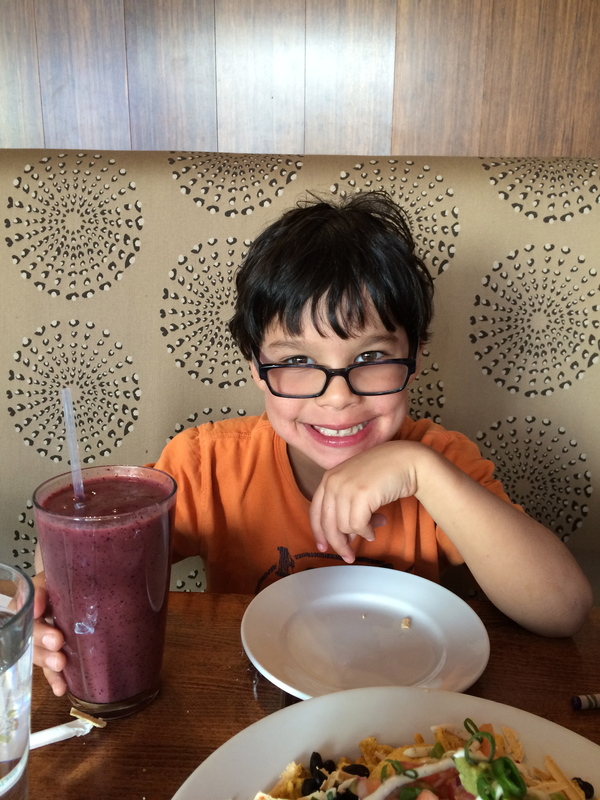 My little brother loved the meal – and that says a LOT, he is discerning in his own, very special way. It’s great to have such a big menu available that is 100% plant-based, and most importantly organic. You can count on this spot to serve you well, every day. Apparently, there is also a location at the airport in Los Angeles, but sadly, not in our terminal! I really hope to be back to California, and will then frequent RFD. In the meantime, I’m going to read Ann Gentry’s (the owner) cookbooks. At Real Food Daily, Santa Monica. Even though it says “bakery” it’s MUCH more than that, featuring a full (very extensive) plant-based, organic menu. 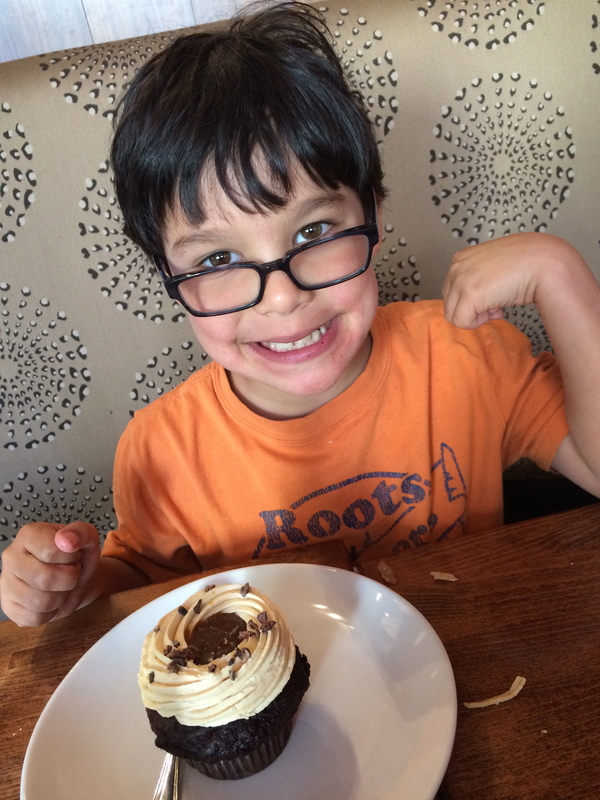 The cupcake looks bigger than him! 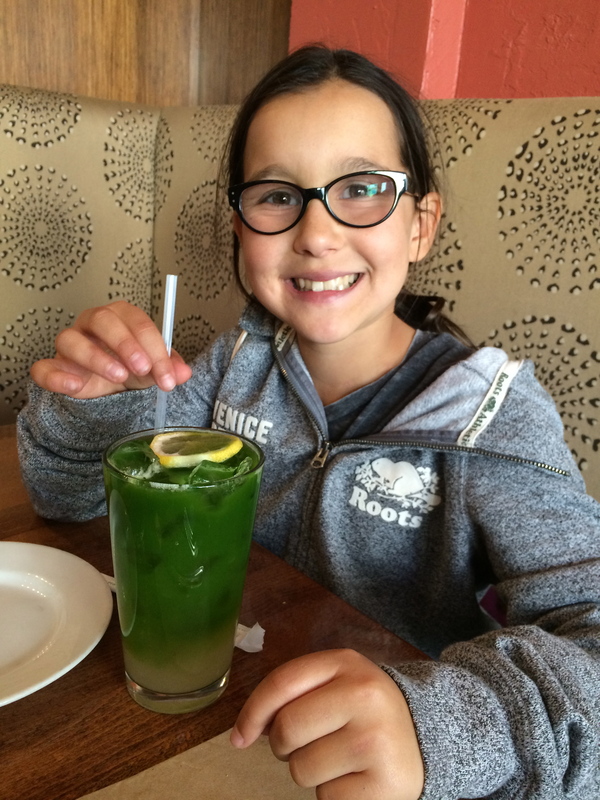 Green juice is good food! You have NO idea how much smoothie or fresh juice my 7 year old brother can put back, in how little time!